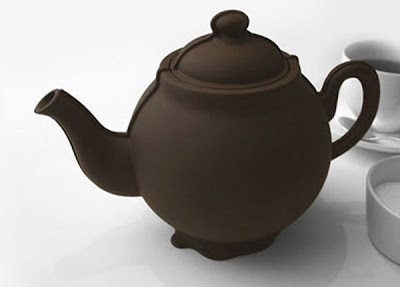 Do you know a Chocolate Teapot? This is a story about a Strategic Transport Planner who was employed by North Shore City council to develop its Transport Strategy. The story goes back to about 2002 when I was chair of NSCC's Works and Environment Committee. I had become frustrated by the lack of a Transport Strategy when trying to implement changes that supported cycling and public transport, instead of, or ahead of, road widening projects for cars. The General Manager of NSCC's Transport division told me that NSCC needed a transport strategy, before the council could usefully engage with priority changes for transport spending. After about a year's looking, I was advised that there were no Strategic Transport Planners in New Zealand. So NSCC cast the net wider and looked in Australia, and then in South Africa. It was in the course of the South Africa search that we found Pete Clarke - or maybe Pete Clarke found us. Anyway. We snapped him up. But he wasn't a Strategic Transport Planner, and so we kept on looking. Our search extended into the Northern hemisphere, and a few names came up. I remember Geoff Mason was sent over to interview the likely ones. Howard was a Strategic Transport Planner from a city in the north of England. He'd worked in Lancashire and Huddersfield and places like that. (Said in a broad Northern accent of course). The first thing he did when he got here was to buy a house - or try and buy a house - in East Coast Bays. he came out with his wife. The next thing he did was prepare a wonderful colour consultation brochure - I'm sure I could find one in my archives if I looked really hard - but not successful so far. It was circulated throughout North Shore - or maybe a part of North Shore - I can't remember. It asked for feedback about the kind of city people wanted. Was it one with widened roads (picture), or was it one with more of a village feel, with people walking, cycling. You get the picture. The result was predictable. There was massive support for the village feel with good PT, cycling and walking. Then there was a staff leaving do, and I was in attendance. Howard was there to, so I took him aside and asked him what was happening. "We have staff meetings in here, where we discuss things and priorities, and when I mention what I think we should be doing on the North Shore they just look at me. I don't get any support..."
Basically he was frozen out. The car culture of NSCC's Traffic engineers was overwhelming. The idea that you could manage traffic flows by using road space differently was alien to them. Their university training was all about road building, road speeds, camber, all that sort of thing. Supply management. Not demand management. It was really sad. Because he was saying the right things - I thought - but the culture, the way we do things around here, was very strong. After a few months Howard sold his house, packed his bags and he and his wife went back to North England. I hope he's happy there. I am worried that we risk creating a culture in our new Auckland Council where the spirit of innovation and creativity that we will need to change Auckland's sprawling habits and wasteful ways won't take root. To get the best people, those knowledge workers with ideas, we need to provide a working environment and working culture that feeds them. It's not too late. 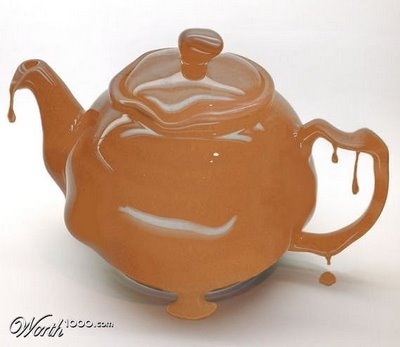 We don't need talented people made to feel like chocolate teapots in Auckland Council. "Crap Tax" to buy off Puketutu Tangata Whenua? You can tell, can't you, that this blog is going to be a crap one. Having been immersed in North Shore City's sewage for the best part of 6 years while I was a councillor there, and having been involved as a commissioner consenting an extension to Watercare's current disposal to Pond 2 Landfill in the Manukau Harbour, I have learned a lot about what we do here in Auckland, and what they do in more civilised parts of the world. "...Throughout North America and Europe, the application of biosolids to land is continuing to increase. 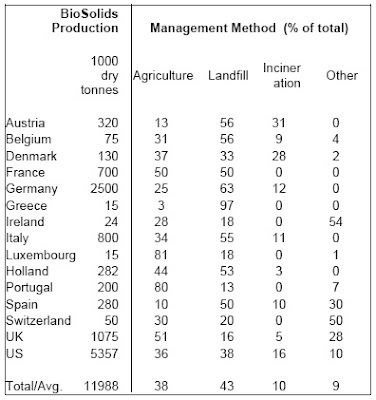 As shown in Table 1, current biosolids applications to agricultural land in Europe and North America has become significant. Although biosolids disposal in a landfill site is common, it should not be viewed as a long term solution. This option is considered to be environmentally beneficial only when such disposal includes methane gas recovery for application as a fuel. Modern landfills are complex and costly facilities to build and operate. They must be carefully engineered and monitored to ensure protection of both groundwater and surface water. In many locations, accessible, long-term landfill capacity is limited. Engineering and siting requirements can make the construction of new landfills prohibitively expensive. Most importantly, landfill disposal does not take advantage of the nutrient value and soil-building properties of biosolids, and takes up landfill space that can be better used for other materials. 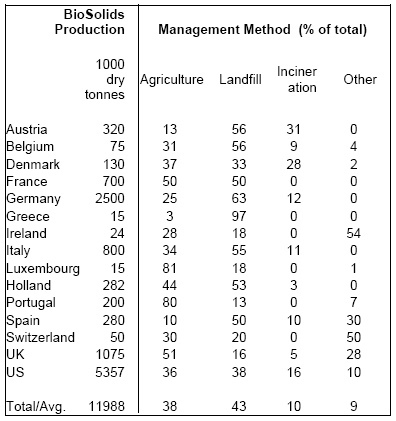 However, landfill is the unavoidable choice when municipal sludge is contaminated with industrial waste and municipal authorities are unable to monitor and control industrial discharges...."
This table is salutory. Auckland puts 100% of our biosolids in a landfill. Quite close to Greece at 97%. But the OECD average (based on this country list) is 43%. We would quite like NZ to shoot up the OECD charts when it comes to GDP, but we're quite happy it seems, to languish at the bottom of the list when it comes to crap. Makes our slogan and brand "100% Pure" seem a bit hollow doesn't it? But it's the last sentence in that quote above that you need to stare at: "...landfill is the unavoidable choice when municipal sludge is contaminated with industrial waste..."
Sydney is a great example of a city that has gone to great lengths to get industrial waste out of its sewers. Metals like Chromium, Mercury, Zinc, Lead and Copper are all banned from Sydney sewers. I've seen Sydney's biosolids mixed with green waste, composted, and used as soil conditioner. But we can't do that with our biosolids because we contaminate them. Here in Auckland we actually make money from dumping industrial wastes into our drains. Or to more precise, Watercare Services Ltd makes money from it. Under Auckland's ancient system of trade waste permits, polluters are able to tip their industrial wastes down the drain, pay a fee to Watercare, and she'll be right mate. Don't you worry about it anymore. We'll sort it out, and thanks for the fee. The revenue stream that Watercare collects from Trade Waste fees is a nice little earner. Subsidises all sorts of other activities and that's probably a good thing. But it means that Watercare has an excuse not to do the right thing. It has to find a hole in the ground to put Auckland's crap - albeit processed, methane extracted, partly dried, and lime added. The problem for Watercare, and for Auckland, is that the Pond 2 Landfill in Manukau Harbour is filling up, and so Watercare applied for consent on 10 November 2008 to put Auckland's biosolids in a quarry on Puketutu Island in the Manukau harbour. There's been lots of news about this in NZ Herald, and there are other blogs of mine about it. In the background there have been a number of curious games underway. One of these has the ARC taking over the Island when the quarry has been filled up, and turning it into a Regional Park. This suggestion has the ARC getting the park for nothing. There is a little conflict of interest of course - because it's the ARC that's one of the consenting authorities for Watercare's biosolids disposal application. The other game is one between iwi and Watercare. ARC has been kept a little bit in the loop about this, and I understand Watercare wants to come and talk to us about their updated plan in a few weeks. However all of this is happening far below the public radar, and I think it stinks. But is it right that the process of transition to one Auckland Council should mean that an issue like the long term management of Auckland's biosolids should be rushed through in a quick expedient settlement? I don't think so. I think we need to clean up our act, and this is the time to be doing it. However, and this is the nub of this blog, on Thursday 15 April, 2010, Watercare Services Ltd, Te Kawerau Iwi Tribal Authority Incorporated, and Makaurau Marae maori Trust Incorporated (the parties) signed a document entitled Puketutu Island Heads of Agreement. So that is the price of "...the spiritual and cultural wellbeing and values of tangata whenua and their ancestral relationship with the island..."
Two dollars for every tonne of crap dumped there. A maori crap tax. That's when I spotted these markings and saw I was wrong. My first thought was they were Japanese. But the guard informed me the ships were visiting from Korea. He said I should come the next day (Friday) when the ships would be open to view, from 10:00am till 10:00pm. So I did come back, and, conitnue my photographic tour. You can see the welcome aboard sign there - and the big gun turret. And here's that delightful: "Thank You New Zealand" sign. From the Republic of Korea. On TV we learned that the sign was a gesture of appreciation for the rescue of Korean fishermen in the recent tragedy. Today, even though it was a bit wet, there was a steady stream of Aucklanders stepping aboard. There were glowing Korean Lanterns lighting the way. All vyer festive. And talk about CLEAN. The ships were like new. And above decks everybody took advantage of the access to pose and to take photos. Sometimes of themselves, of the Korean Officers who so politely showed us around, of the ship. I saw a Korean Officer use a visitor's camera to take a picture of the man and his daughter. And visitors also took photos of Auckland from the ship's deck. You begin to see how this sort of image can brand Auckland. A bit different from the City of Sails, but still a city on the water. With a story to tell. A changing story. You can see how Shed 10 can be adapted for this sort of public experience and amenity. This is about events, and about marketing Auckland. And its relationships with its neighbours. The Korean population is growing in Auckland. This sort of visit brings countries together, and people together. And this was the Hyundai display. I thought they only made fuel efficient cars. According to the sign: "the world's largest and leading ship yard"! There were also a number of audiovisual displays. Pretty robust stuff. So there you have it. An interesting visit. Makes me think about the sinking of the Rainbow Warrior. A major part of Auckland's maritime history. We need to make more of that. Such a story. So much drama. And another country... they even beat us in the last Rugby World Cup didn't they? I was in Singapore for a City Development Conference (paid for conference organisers Marcus Evans) a year and a half ago, and this building was not there. Inside seems to be vast areas of empty space. Cavernous roof spaces. Artwork and sculpture and strange shapes for services like air conditioning. Places to sit and have a meal or a coffee. Part of it is a hotel. When I went there was a queue of about 50 to have a look up the top. Cost $20.00. I was delighted to discover I qualified for a senior citizen discount! First time that's happened to me. Here's the view from the top, looking back in the direction of that motorway shot. To the right you can see Singapore's equivalent of the London Eye. To the left, looking down, you can see the Helix walking Bridge. And that green seating area you can see by the waterfront on the left are the seats facing the theatre where the kids are rehearsing for the Youth Olympics (another blog in this Singapore series). Yep. A swimming pool with a view to die for - or possibly to die from! This is set aside for Hotel residents, but people like me could wander and wonder. Imagination. Proof that I was there. Roll on the next international all expenses paid conference. And I learned a lot about Affordable Housing too. In this closeup you can see what the time is, but more importantly you can see that a car will be charged $2:00 Singapore (about the same as $2:00NZ), for access. While a truck will be charged $4:00. That rate applies between 6:30pm and 7:55pm. It's more expensive earlier in the evening (peak rush hour), and cheaper later. Once you're at this point there's no going back I suspect, but it's a constant reminder how much your driving will cost at the time. Apparently Singapore's Off-Peak Car scheme was introduced 15 years ago. The idea was you buy a car with a RED registration plate, and you can only drive it between 7pm and 7am on weekdays, and without restriction on Sundays and public holidays. It seems that the scheme has been tweaked by Singapore's Land Transport Authority (LTA). The updated scheme kicked off on January 25 this year. Under the scheme car owners who convert their normal plates to OPC red plates receive $1,100 in cash for every 6 months the car remains an OPC. The new scheme also allows OPC drivers to use their cars unrestricted on Saturdays. If owners want to drive on days outside the licence they can pay $20/day for an "e-licence" in advance via internet etc. The LTA envisages between 10 and 15% of all cars in Singapore will be OPCs. At present 8.6% of Singapore's car population are OPCs. As you might expect things are more complicated than this. For example to buy a new car in Singapore (OPC) or not, you need a Certificate of Entitlement (COE). These are issued in restricted supply. This is a further means of controlling the population of cars. I never did find out what the chrome monster is just the other side. And by the way. This is all happening on a floating stadium. If you scroll back up you will see how this platform is moored against the waterfront for this event. The other major event happening in Singapore streets, a few weeks after the Youth Olympics is Formular One racing. In the city streets. Talk about a happening place. This visit made me think a little about Auckland's aspirations on the global stage. Singapore is one hard act to follow. I checked out Wikipaedia. One of the first attempts to define, categorize, and rank global cities was made in 1998 by the Globalization and World Cities Study Group and Network (GaWC) based at the geography department of Loughborough University, United Kingdom. The roster was outlined in the GaWC Research Bulletin 5 and ranked cities based on their provision of "advanced producer services" such as accountancy, advertising, finance, and law. The GaWC inventory identifies three levels of global cities and several sub-ranks. This roster generally denotes cities in which there are offices of certain multinational corporations providing financial and consulting services rather than denoting other cultural, political, and economic centres. The 2004 rankings acknowledged several new indicators while continuing to rank city economics more heavily than political or cultural factors. The 2008 roster, similar to the 1998 version is sorted into categories of "Alpha" world cities (with four sub-categories), "Beta" world cities (three sub-categories), "Gamma" world cities (three sub-categories), and cities with "High sufficiency" or "Sufficiency" world city presence. 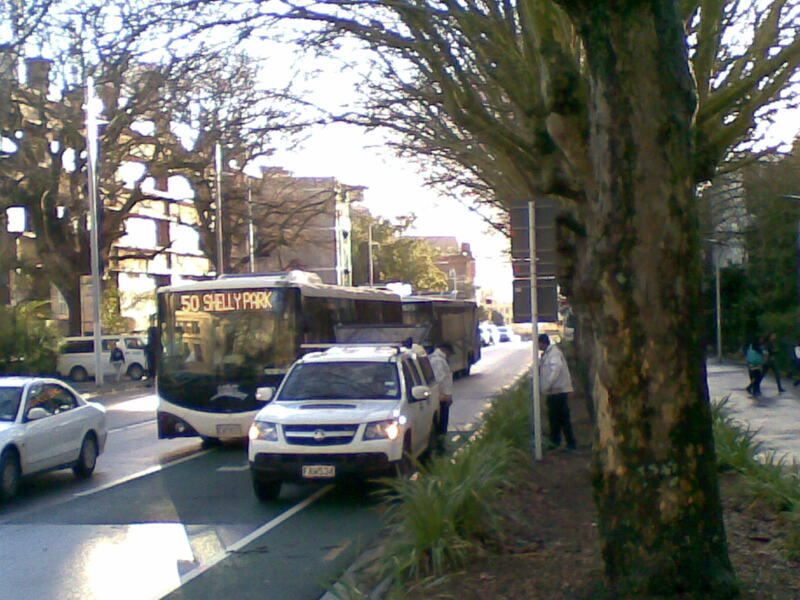 The current Auckland debate on buslane enforcement is unfortunate. There is a risk that election fervour and froth will triumph over reason, that populism will supress the best decision. 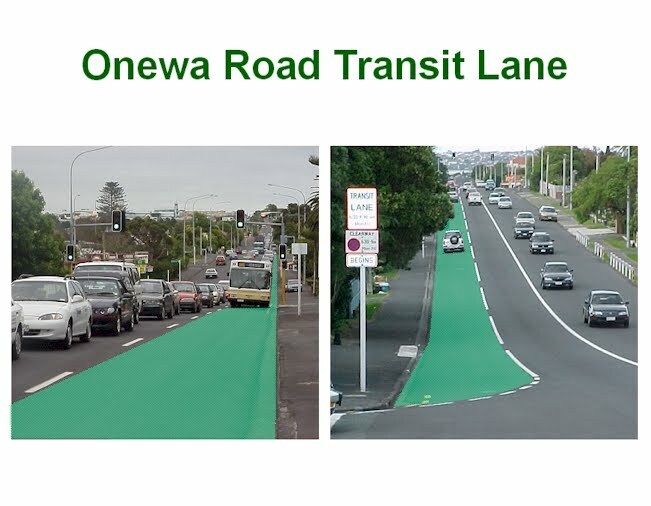 It is an action replay of what happened when North Shore City Council tried to enforce the buslane on Onewa Road when I was Chair of its Works and Environment Committee in the years 2001 - 2004. There had been a buslane down Onewa Road for years already. It was put there by the old Birkenhead Borough Council. The problem was that it was not enforced. No-one took it seriously. The consequence was that cars used it whenever they wanted to, and buses didn't get commuters down to the motorway and over the bridge to their work in Auckland any quicker than driving a car. So the NSCC decided to do something about it by proper enforcement. We dug out some statistics from enforcement done by the old Borough Council. They found that if they enforced the land one day a week - by using the police to fine motorists - then no-one took it seriously. If they used the police two days a week - still motorists took the risk and used the bus lane. But if they had it policed four days a week - then motorists took it seriously. But that was all pre 1989. For years NSCC had ignored the lane. 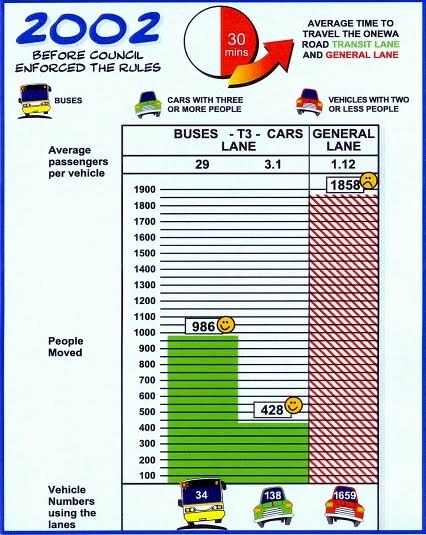 This table shows what was happening in 2oo2 without enforcement, but after NSCC had declared it a T3 lane. The traffic data are for an average peak am hour. At the time it took 30 minutes for cars and buses to get down Onewa Road without enforcement. You can also see how many people got down Onewa Road in a peak am hour (about 3200 in 2400 vehicles). 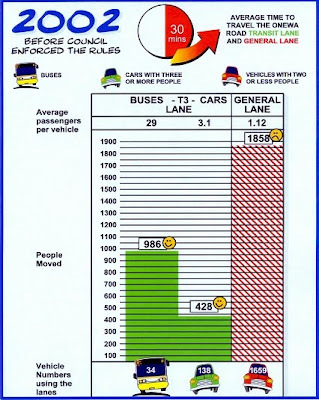 Some went down the general lane (average of 1.1 people/car) and others went down the T3 lane (for buses and cars with 3 or more people). 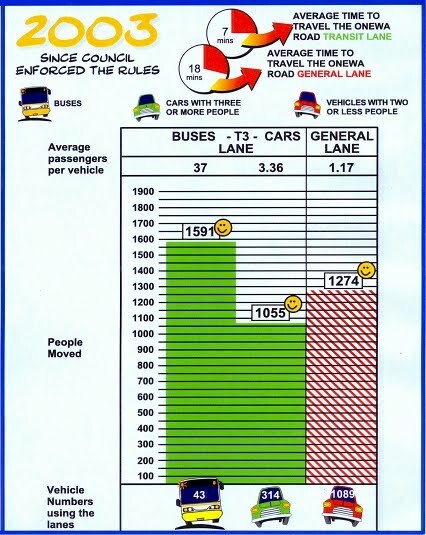 This table shows what happened by 2003 after the Onewa Road T3 lane was enforced with the same video enforcement that Auckland City is using on its bus lanes. 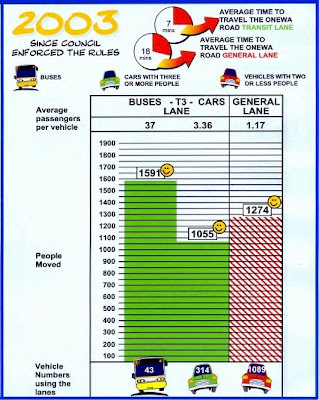 You can also see that Onewa Road carried 3,900 people/hour in 1500 vehicles on average, after enforcement. And that nearly 1600 of them went by bus instead of 980 on average. NB there was capacity for more bus passengers, but patronage increased steadily. What then happened was that NSCC applied to Parliament for powers so its staff, subject to a code of practice could do the enforcement. Up to then NSCC was reliant on enforcement by the police who had other priorities. Sure there were some teething problems, but it's in place now and accepted by the public and drivers. A lot were fined to begin with. There were appeals. Some won, and some lost. But the drivers have been educated through this process. You only have to look around the world to see how necessary enforcement that is robust is, to ensure bus lanes are effective. In recent years, there has been a wave of interest and innovation in strategies to make bus operations more efficient and effective. Cities around the country have created new Bus Rapid Transit (BRT) systems and pursued other strategies to make their regular bus services faster and more reliable. One common approach in urban centers has been the dedication of street space for priority use by buses during designated hours. But experiences in congested urban centers have shown that simply designating a bus lane is not enough to ensure that operating conditions for buses are improved. Amid the intensive competition for street and curb space that occurs within central business districts, the effectiveness of bus lanes can be quickly undermined in the absence of ongoing enforcement efforts. A vehicle stopped or parked in a bus lane requires buses to weave into adjacent traffic lanes, reducing the useful capacity of already-congested urban streets. Thus, strategies to ensure the effectiveness of bus lanes are essential not only for the success of BRT and other strategies to speed bus service, but also to improve the overall efficiency of traffic flow on city streets. An important lesson that has been learned from earlier experiences with bus lanes is that some mitigation of their effects on other transportation system users is often required before enforcement becomes feasible. In New York City, curb access for delivery trucks is at such a premium that even steeply-priced tickets are seen as a necessary cost of business and do not provide an effective deterrent to the blockage of bus lanes. A recent study of the feasibility of BRT on New York City’s streets by two members of this study team concluded that new street designs that accommodated bus lanes while also extending the hours available for goods deliveries would make stricter enforcement more politically feasible. On streets that lack the width necessary to accommodate these conflicting demands simultaneously, pricing or other management strategies may help ensure efficient curb utilization during the hours in which they are available for commercial use. How will the City assure that bus lanes are enforced? Improving the enforcement of bus lanes is a critical element to ensuring the success of Select Bus Service, and we are working closely with the New York City Police Department on enforcement strategies that are both aggressive and sustainable. We are researching best practices around the country and outside the United States for bus lane enforcement strategies. In the long-term, we are also working towards the implementation of bus lane enforcement cameras, which would automate the enforcement process by issuing violation notices to vehicles that illegally drive or park in the bus lane. Bus lane cameras require approval from New York State, and draft legislation enabling enforcement through cameras was recently introduced in Albany. In the long-term, we are also working towards the implementation of bus lane enforcement cameras, which would automate the enforcement process by issuing violation notices to vehicles that illegally drive or park in the bus lane. Bus lane cameras require approval from New York State, and draft legislation enabling enforcement through cameras was recently introduced in Albany. The only time it is legal for a vehicle other than a bus (or an emergency vehicle responding to an emergency) to drive in the bus lane is to make a right turn at the next available opportunity. Will emergency vehicles be using the bus lanes? Emergency vehicles will be allowed to travel in the bus lane when they are responding to an emergency situation. Can taxis drop off/pick up in a bus lane? Can taxis drive in a bus lane with a passenger? As with other vehicles, the only situation in which a taxi can enter the bus lane is to make a right turn at the next available opportunity. As a result, a taxi could pick up or drop off a passenger in the bus lane only if the taxi does not occupy the lane for any significant length of time, and the driver turns right at the next opportunity. Can non-transit buses use a bus lane? Can school buses use a bus lane? Currently, all buses (as defined in the New York City Traffic Rules) are allowed to drive in bus lane. If bus lanes become congested at some point in the future, consideration may be given to limiting the use of bus lanes to Transit buses only. How will deliveries be handled to my store? Each of the corridors have different strategies with regards to running ways, and consequently the approach to allow for reliable deliveries to stores will be based on the type and duration of bus lane operation. The team will consult with local business to identify solutions. On all corridors, deliveries can be made before or after peak travel hours, and on weekends. Where blocks are short, deliveries can be made from side streets. In the case of the Fordham Road-Pelham Parkway corridor, all day bus lanes are in effect in both directions so "windows" in the operation of the bus lanes will be provided midday to facilitate deliveries to the stores. Between 10:00am and noon, deliveries will be permitted on the south side of Fordham Road. Between noon and 2:00pm, deliveries will be permitted on the north side of Fordham Road. In addition, before 7AM and after 7PM curb space will be available for deliveries. Finally, delivery zones have been established on side streets. Where will people park who want to go to stores on a block with a bus lane? As each of the corridors have different running way concepts; parking will be handled slightly differently for each of the corridors. Overnight parking will continue to be permitted at the curb. Where appropriate, a small amount of parking will be established on side streets adjacent to commercial areas. In the case of the Fordham Road Corridor, given that all day bus lanes are proposed in both directions, for most of the day, parking will not be permitted on Fordham Road. There are some municipal parking facilities in this area. Outside of the hours of operation of the bus lanes, i.e. before 7AM and after 7PM, curb space will be available for parking. How do you know that all traffic will not come to gridlock if you do this? The plans for the SBS demonstration corridors have been designed in such a way as to result in minimal traffic impacts. In the majority of cases, the proposals involve the removal of an existing parking lane. Traffic analysis shows that in most cases creating a separate lane for buses and right turning vehicles results in an improvement in traffic conditions. Where current travel lanes have been converted to bus lanes it is not expected that a significant worsening of traffic conditions will arise. To evaluate these impacts, the project team is completing a detailed evaluation of the traffic conditions on each of the proposed Select Bus Service corridors. At major intersections, the team is completing analysis to quantify the impacts of the proposed Select Bus Service priority measures. Where impacts are identified, mitigation measures will be included to minimize the impacts. CAMERAS to deter motorists from driving in bus and tram lanes illegally have been installed in Nottingham. The city council has set up Automatic Number Plate Recognition digital cameras at hotspots for cars and motorcyclists using bus or tram-only lanes. I found these links without effort using Google. Bus lane enforcement is not rocket science. But it is essential if they are to work and deliver benefits to commuters, sufficient for them to leave their cars at home. It's about behaviour change. Once Aucklanders get the picture then the level of enforcement may be scaled back somewhat. But the lesson from Onewa Rd is that scaling back on enforcement too much too soon is ineffective. Public Transport is a case of build it and they will come, but it's also a case of slow buses are empty buses. Poor enforcement is like a wet bus ticket. Few take any notice. It's just another sign of public transport not being taken seriously by politicians. But it can be improved in Auckland. There's always room for fine-tuning. I took this picture yesterday (9th August, about 7:55am) on Symonds Street. You can see Council's video monitoring team arriving to set up (they were unloading their road signs and video equipment). Their truck is parked exactly in the bus lane. You can see two buses have been forced to pull out into the line of general traffic. That's a good look isn't it? Practice what you enforce guys.